Preventing malnutrition in older adults isn’t just about eating the right foods: drinking enough fluids and keeping hydrated is also important. Older people in particular are at risk of dehydration due to decreased thirst sensation. 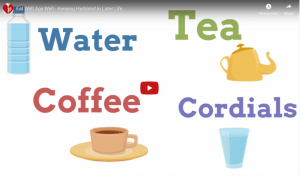 Watch our new info-graphic which explains the issues dehydration can cause, as well as simple ways to ensure an older person is drinking enough. For more information on keeping hydrated, you can also read the Food First fact sheet from the BDA.